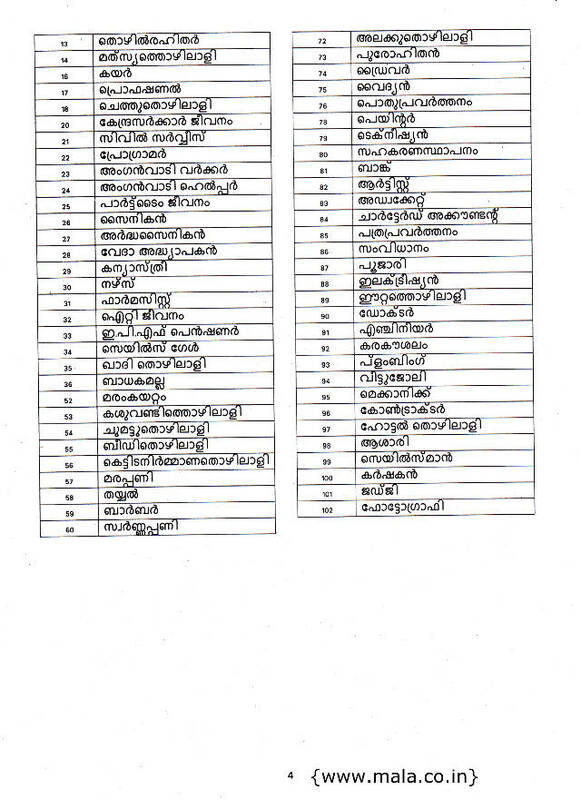 Process for renewing existing ration cards in Kerala is in progress. 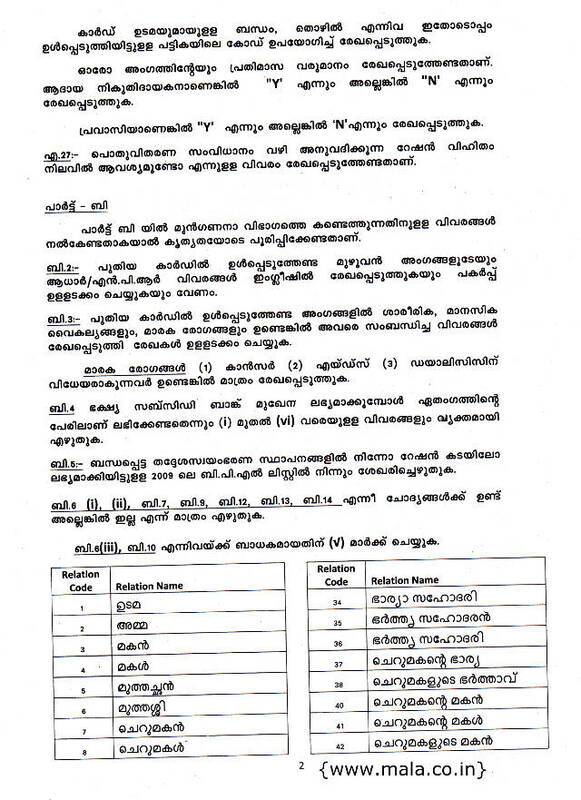 The first stage, issue of applications, will be completed by 17th of January, 2015, according to Kerala Civil Supplies Department. Rather usual procedure, this renewal includes one more process ie., consideration of finding beneficiaries according to National Food Security Act, 2013, India. Hence the procedure is more stringent and if any deliberate misleading / wrong information may lead to punishment as per the law, you are warned! Ration card holders seems panic before and after collecting application form, have questions, yet to be clarified. Some of the general clarifications are given here. Application form for renewing existing ration cards are available at the ration shops where your card registered and collecting rationing articles. Existing card holders to be personally collected it at free of cost. The form is partially filled with the existing data and printed specifically for each card holder's name. Here one can note that card owner's name may have changed to the senior woman of the family. Since it is unique and only one has been printed, please make sure you are not making any mistake in the form or spoil the form by mishandling. When you collect your form from the ration shop verify the existing card number and form number are same. Ask to shop owner: Date, time and venue of the Camp for the return of filled-in form and photo capture session. It is considered to be criminal offence if any of the information given by applicant for ration card renewal process. In such cases there will be legal action against the applicant and may prosecuted as per the law. Control Room Numbers: 949-599-8223 / 949-599-8224 / 949-599-8225. Page 1, Page 2, Page 3, and Page 4. You can download ration card renewal guidelines in pdf format here. Read first two pages thoroughly prior filling the form. It is advisable to make a photocopy of the form and fill all the data in it using a pencil. After you feel everything found correct and satisfied, you either fill the form yourself or bring the unfilled original form, supportive documents and filled copy to the camp and show the experts / helpdesk who are available for helping the form filling in the camp. If you are not availing any of the facility, you can leave blank or answer "No". Please note that BPL and AAY ration card holders to be given their details accurately otherwise the Category may become "General" instead of "Priority". If name of the elder women given in the form is no more, death certificate to be attached for deletion and therefore new owner name can be submitted with the proof. Furthermore, if any relevant field required more space, for example, you wanted to add more than 3 members, details can be written in a white paper and attached to the form. Don't forget to attach the supporting documents in this case. Civil Supplies Department has announced that Identity verification, photographing of the elder women will begin on 19th onwards and its venue will be close to card holder's ration shop. While coming to the camp, originals and a self attested copies of existing ration card and Identification proof should be with elder woman. I am the head of the family. I am 63 years old eldest male member. The only female member of my family is my daughter in law who is 29 years old. She is refusing to be the owner of the card on the pretext that she is much younger than me and also that she doesn't want to be responsible for the information given in the card and that she doesn't want to be prosecuted if any of such information is wrong. I have therefore filled my application on my name. Only issue comes if you falls under "Priority" Category. Otherwise there is no problem at all. Camp officials may ask a consent letter from your daughter-in-law. You can get your raion card renewal through TSO / DSO as a normal procedure. There will be notification from Deaprtment for those who are unable to attend the campaign. In this case you have to personally visit the TSO / DSO after getting appointment with officials. More details can be had from your DSO / TSO. According to Civil Supplies Department, there will be a special photo session camps soon for those who was unable to attend the current ration card renewal campaign. It will be arranged one camp for 20 Ration shops. Department also arrange mobile units for bedridden citizen if medical certificate has been provided. Photo session camps may further be extended to TSO/DSO offices if required. 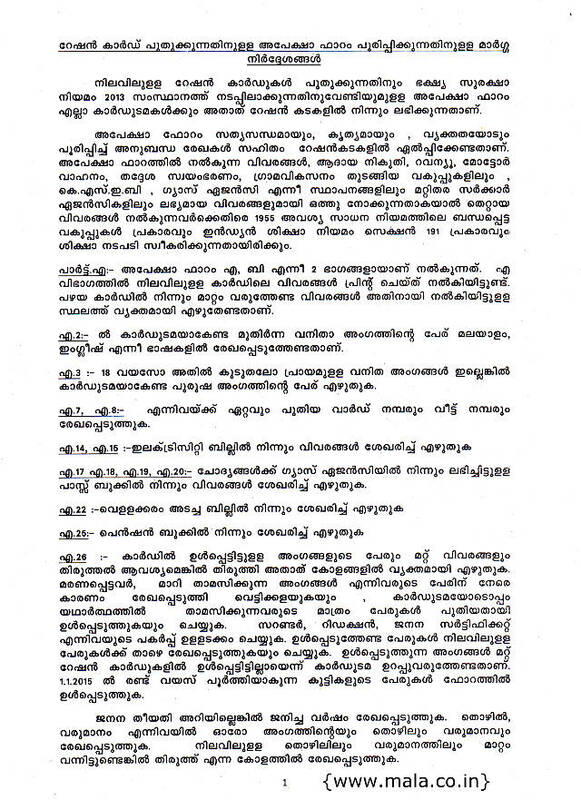 Ration card renewal. Photo session missed. I could not attend the photo session . What is the way out to get our ration card renewed. There were separate photo sessions for those who could not attend in the main campaign - one in your locality itself and after that concerned TSO/DSO offices. Your ration card may not be issued until you appeared for photo session. Better contact your TSO/DSO immediately for further information. 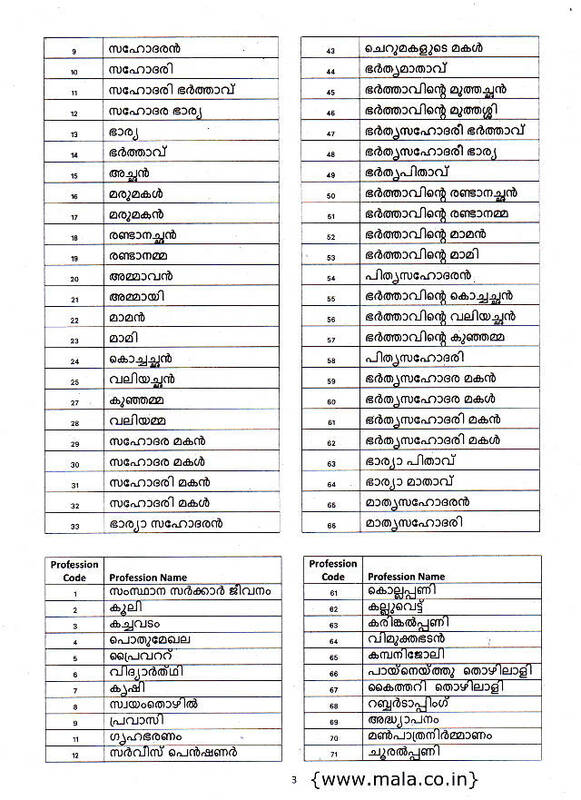 CORRECTION OF RATION CARD DETAILS- MISMATCH VERIFICATON No. Verification Number you get through mobile SMS after login to your details. If you have not received it even after visited 3rd page, press resend button for new SMS that contain verification code. Read more here. I WANT TO INCUDE MY SONS NAME IN THE RATION CARD. WHICH I GOT IT CANCELLED DUE HE HAS BEEN SHIFTED TO BANGALORE. WHAT IS THE PROCUDERE TO INCLUDE HIS NAME IN THE RATION CARD. After received new ration card, you can apply for inclusion of your son's name. The facility is currently frozen but you can give a hint to officials if you want. Utilize accuracy verification website and submit a request for it. If he has been permanently shifted to your place, make a request in the correction box specifying "Inclusion of Son's Name: Name, Name (English)" etc. as order given in the second page and submit. Don't think that the procedure has been completed. It will be an intimation to the officials. Correction doesn't mean inclusion of new name. Its a little bit lengthy procedure. I missed the chance to verify the data on the aplication form.Could I get another chance? Sir, i want to submit the new card (BPL) copy in college for the scholarship purpose. when do we get the new ration card? It will be notified in the newspapers. What are the different ration beneficiary categories as per the new food security laws? What does the SS type of ration card mean? I couldn't find SS in NFSA. If it is S, it would be State priority. I have recently settled in Kerala. I don't have a ration card in the name of any of my family member.I could not apply for a new card as i was outside Kerala. Can I apply for one now online? In Kerala you can't apply for a fresh new ration card either online or in person. It can be done only after completion of issuing new ration card as per NFSA system in the state. Hi, my name is ajantha. I am writing this letter for my mom. Her ration card is stolen by my ex in low. Then she put her photo front of the ration card. Then now she keeping for herself. She doesn't want give up. So is it ok to cancel this card and possible to take new one? You can make an application to your TSO / DSO / CRO for canceling existing ration card due to misuse or lost reasons. If they accept, new application can be given to issue fresh or duplicate ration card. Due to some reason I couldn't renew my ration card. How can i renew the card now?